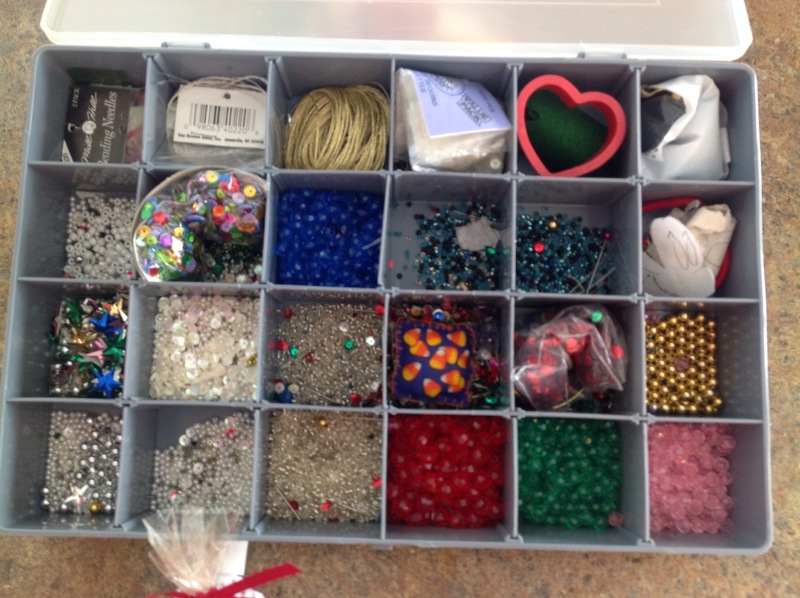 Years ago, as I was rummaging through the craft section of a local area garage sale, I stumbled upon a box of beads, sequins, golden threads, and patterns. I scooped it up and asked the owner how much was needed for the treasure. To my delight, she said $1.00 would fit the bill. I gathered up a few more crafting trinkets (some sewing and embroidery supplies) along with the box of sequined treasures, paid the kind lady, and I was on my way. Shortly after arriving home, I took out a heart shaped cookie cutter and traced several small hearts on a light gray felt square. 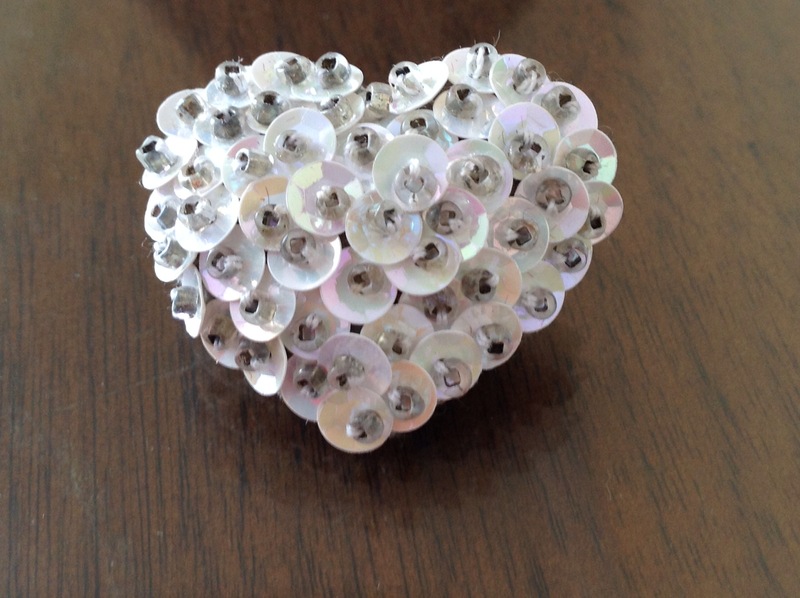 I carefully cut the heart shapes out and stitched on enough sequins and beads to cover the entire surface of one heart shape. On another heart shaped felt piece, I secured a pin back so that eventually, my project would become a pin. 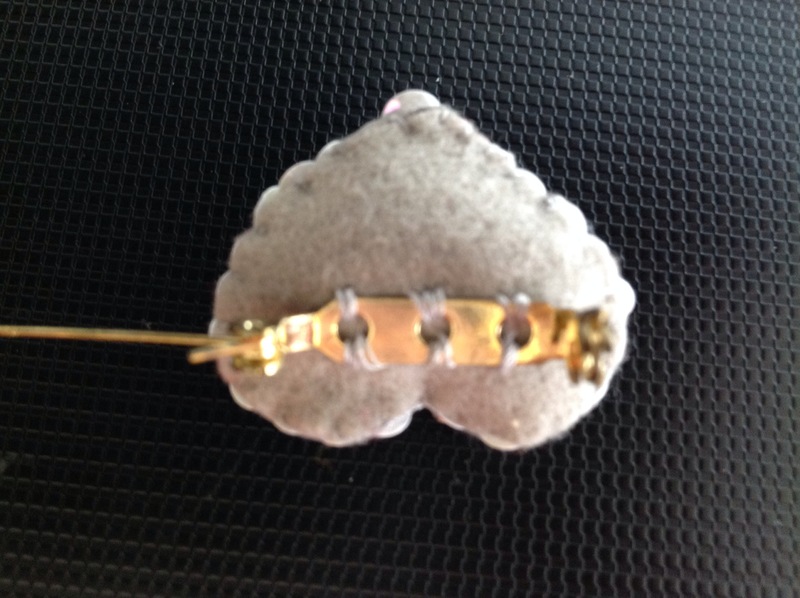 I then used a tiny blanket stitch (gray thread or monofilament) to sew the two felt heart shapes, wrong sides together, leaving a small opening to stuff in a bit of batting. After closing up the opening, I would plump up the heart shape by using my fingers to evenly distribute the batting tucked inside. Voila, the pin is complete! I then used printable business cards to create a message, printed a sheet and punched two holes in each card to secure the pin back. 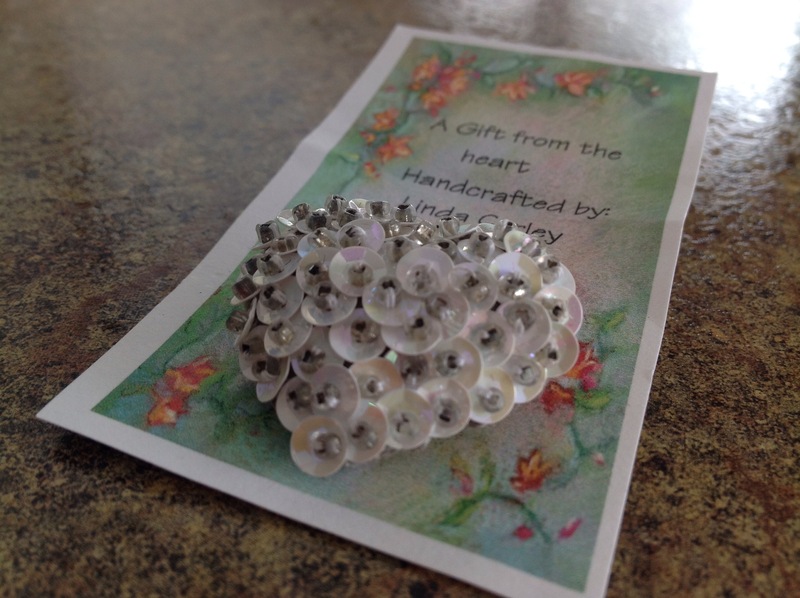 I used small cellophane bags to envelope the pin/card and tied a bow for a sweet finish. I have given these pins out at weddings, for Valentine’s Day, and for Mother’s Day. They are quick and simple and require very few supplies. Happy Valentine’s Day! 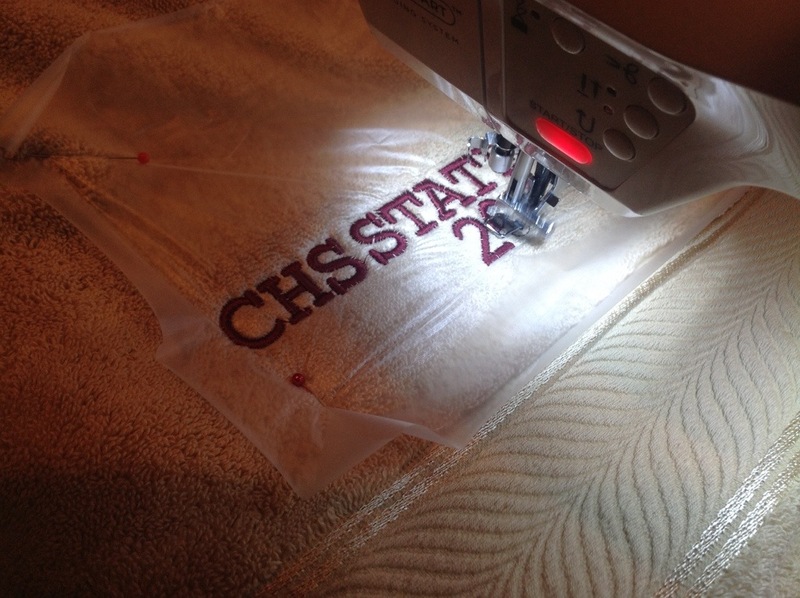 Every year, about this time, I volunteer to embroider the state towels for our boy’s and girl’s high school swim teams. 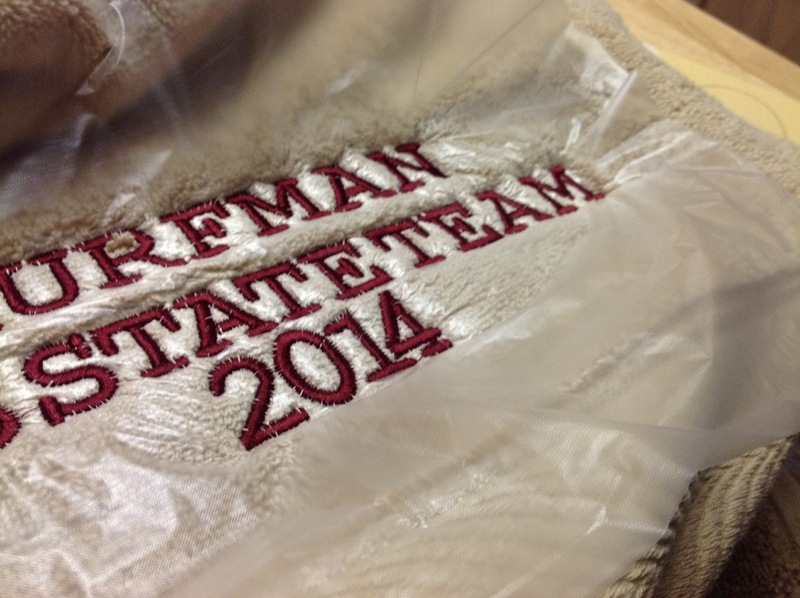 Today I spent the day embroidering towels for next weekend’s state event. Towels are often tricky to embroider so I thought I would take you through the process that I use to make sure my machine embroidery looks clean and concise. Remember that it’s very important to stabilize your work so that the stitching sits on top of the fabric instead of burying itself in the nap of the towel. The stabilizer will also ensure a solid foundation for the design. 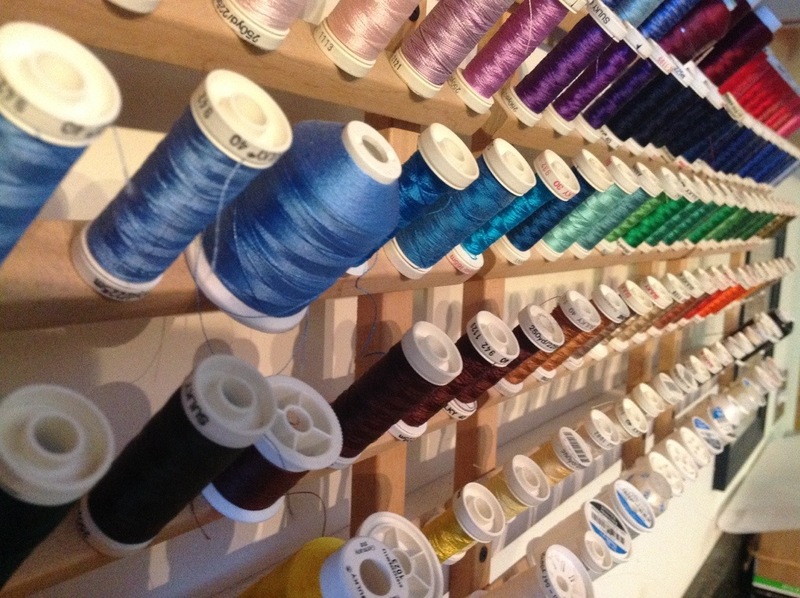 Make sure to choose a thread color that compliments the fabric color. 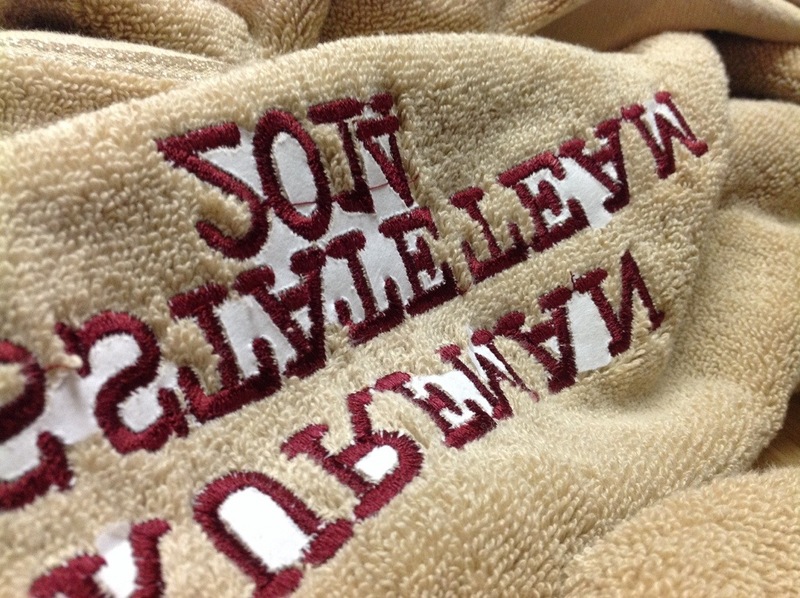 I used maroon thread against the camel colored towel to signify our team colors…maroon and gold. Hoop a piece of tear-away stabilizer in the embroidery hoop. 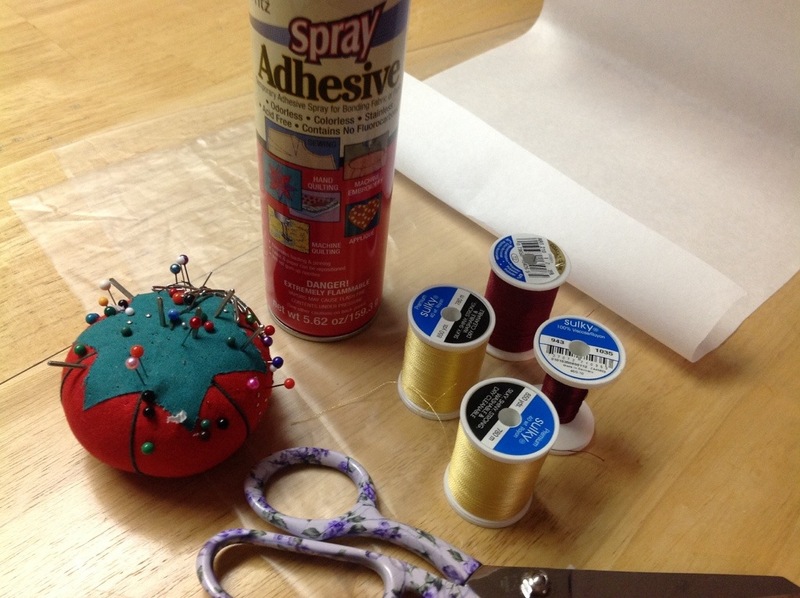 Carefully spray the stabilizer with a temporary adhesive made specifically for fabric projects. I really like the Sulky brand spray adhesive but my JoAnn Fabrics doesn’t seem to carry it anymore. 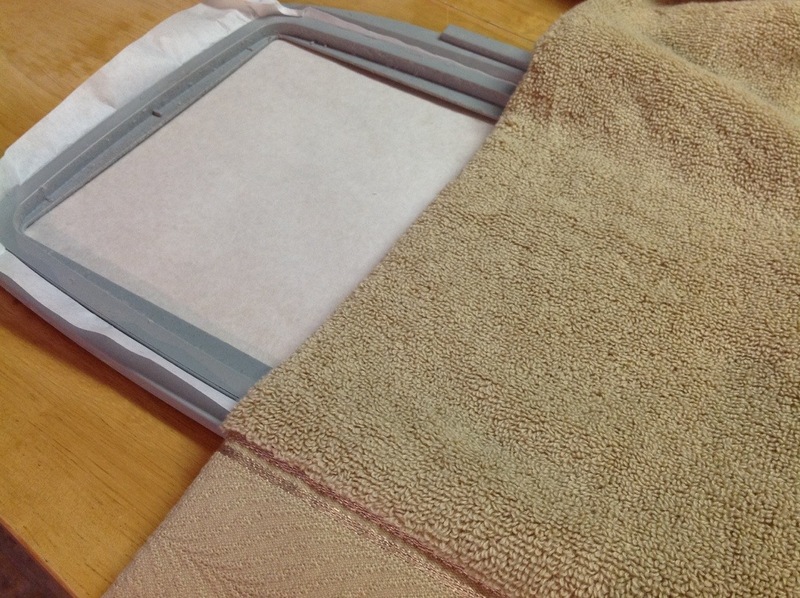 Next, fold the towel in half, length-wise, right sides together. 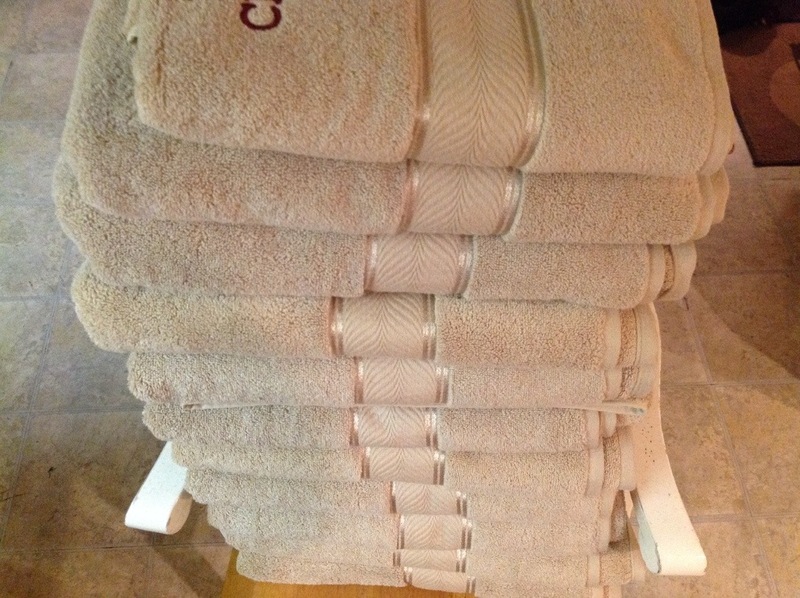 Center the towel over the hoop, carefully placing the fold at the center register marks. Open out the towel and smooth it in place. 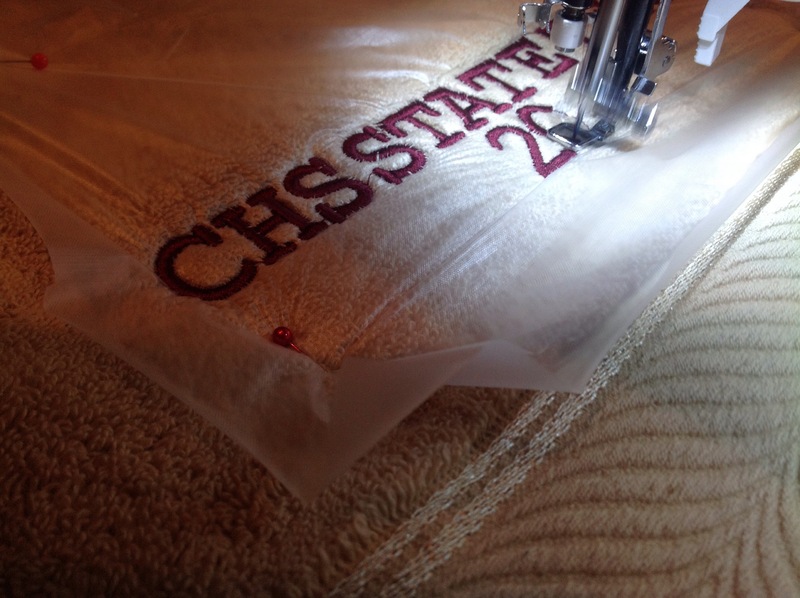 Secure a piece of water soluble stabilizer on top of towel, fitting inside the hoop. 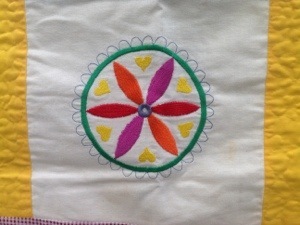 Slip the hoop into the embroidery module and stitch your design. After you’ve completed your design, remove from machine, trim threads and tear away the stabilizer. Remove excess soluble stabilizer, I use a burst of steam from the iron to clean up any remaining bits left behind. Here’s the finished product. I am currently working on my 12th towel and still have a few more to go. Happy Stitching! 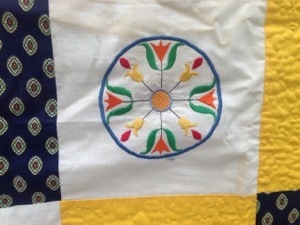 When I have time, I love to visit resale shops and garage sales to find objects that I can incorporate in my sewing projects. I often buy old backpacks and purses just to cut out the closures and fasteners for other projects. I sometimes buy resale clothes with great looking buttons, only to cut them off and use the buttons to make some of my less expensive clothes look more expensive. For this tote, I made the actual bag out of pre-quilted fabric that I found at Good Will. I filled the inside of the tote with fasteners and pockets to hide trinkets and valuables that M might need during her travels. Around the top edge of the bag, I stitched a trim that was originally found at the hem of a pair of capri pants that I bought at a garage sale. 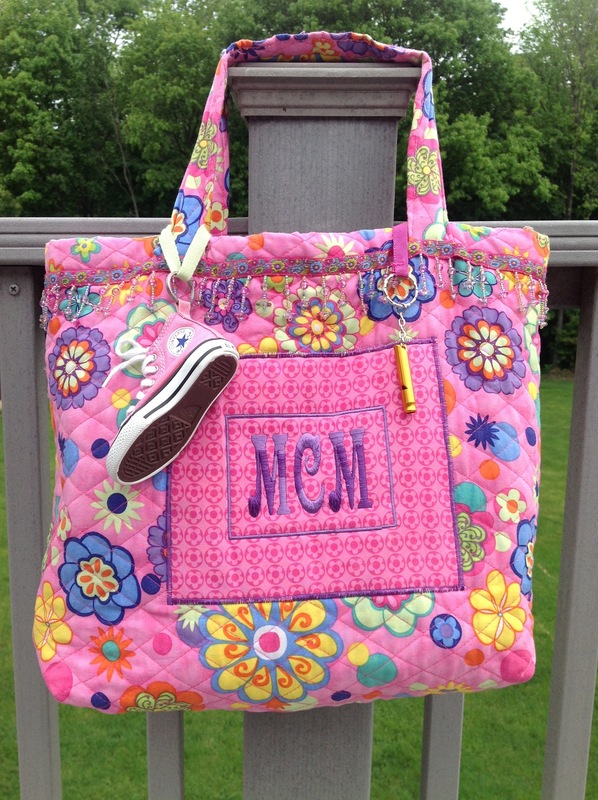 After all that, I used my embroidery machine to personalize the tote. M seems to love this colorful bag and she smiles when others ask her where she bought it. She proudly replies, “My mom made it especially for me”! I must admit, this is not a newly completed project. 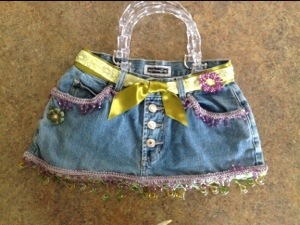 I was cleaning out my closets yesterday and I stumbled across this denim bag that I had made months ago. 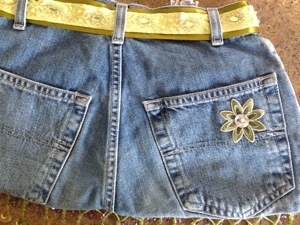 I looked it over and was pleased that I was able to use a junior-sized pair of jeans to make such a darling purse. Like most of you, I am always looking to repurpose things that are past their usefulness in their current state. About a year ago, while packing up clothes to send to the local resale shop, I found these jeans in my daughter’s drawer. She hadn’t worn them in a while for she had grown and their length was halfway up her ankles. That afternoon, I snipped the legs off at the crotch and rummaged through my trims and sewing notions to try to find the best pieces to adorn my new bag. I had purchased a few clear handbag handles on clearance at JoAnn Fabrics and was thrilled to tack them on to the waistband with a few quick stitches. I really only had one seam to sew across the bottom of the bag. 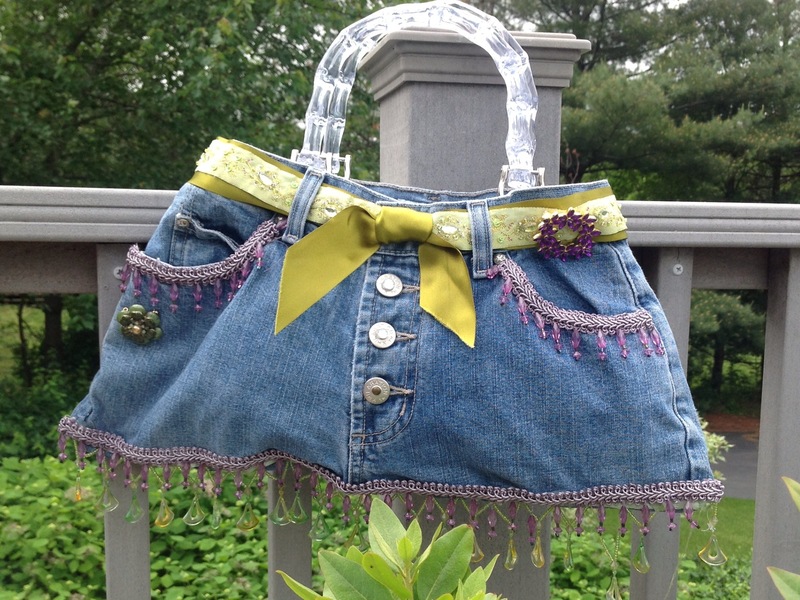 All that was left was to string glittery coordinating ribbon through the belt loops at the waist, glue and stitch on a few embellishments, and voila, a cute-as-a-button handbag was born! This is a project that my daughter and I made together. I wanted her to get experience on the sewing machine without having to fiddle with a lot of busy work while she sewed. 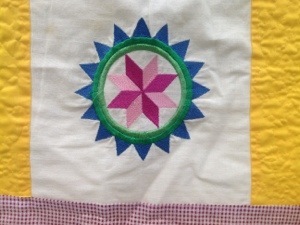 What I love about the project is that the seams are pinked with shears and its all simple, straightforward measuring and sewing. 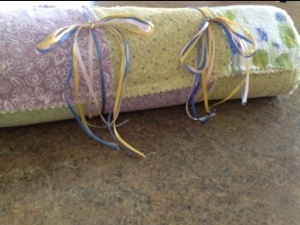 We picked out four coordinating flannel fabrics and cut 112 (6×6″) squares with pinking shears. We placed the squares 8 across and 14 down. (You can certainly make it larger or smaller to suit your needs. ) M sewed the rows with seams, wrong sides together, for a more rustic look. 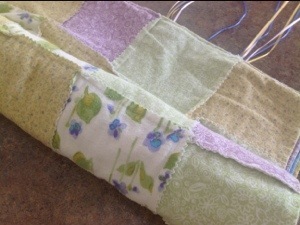 Before adding a pieced backing (made with odd shaped flannel scraps), M stitched three colored ribbons into the side seam of this travel blanket so that it can be tucked away and pulled out when needed. M sometimes ties her blanket to her backpack or suitcase so it’s there when she needs it. I’ve washed this several times and it seems to get softer with each washing. 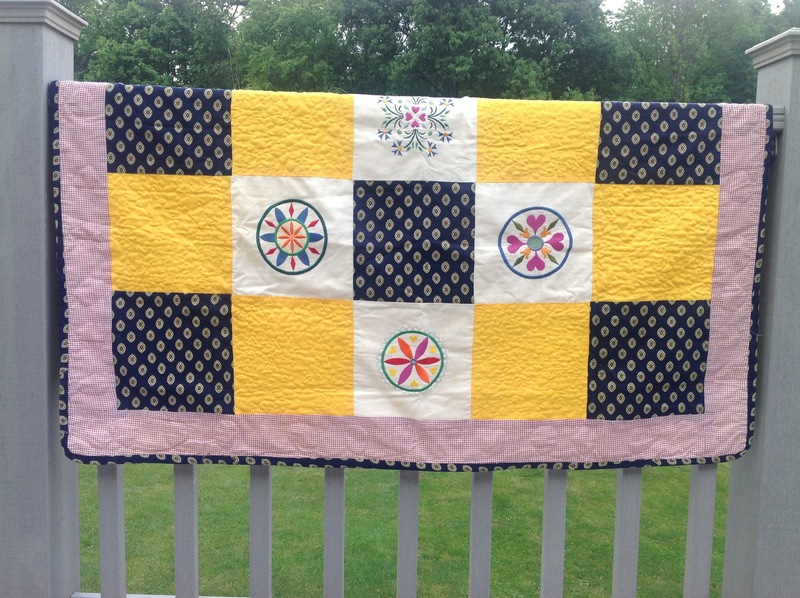 This is a great beginner quilt project for kids! I do believe that Good Will will always be one of my favorite places to shop. 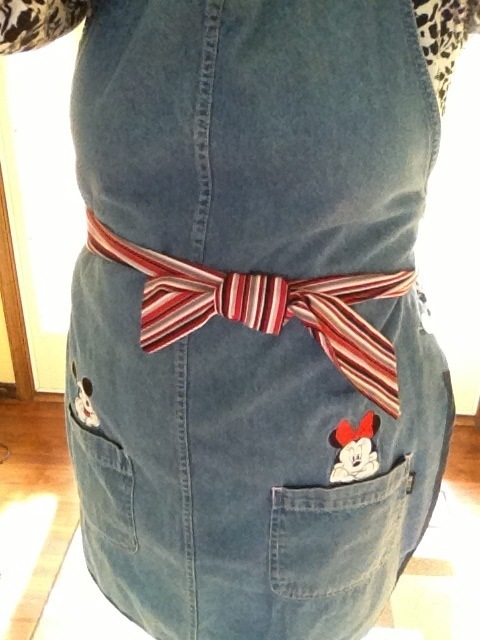 Last week, I found inexpensive yards of quilting fabric, spools of embroidery thread, and an old denim, overall-style jumper that I quickly converted into a cute, durable apron for the kitchen and garden. When traveling through the aisles of resale shops, always keep an open mind. Look for good quality items that can be reused or repurposed for further enjoyment. Make sure to carefully launder or dry clean your clothing purchases. I once bought a backpack for $1 only to tear it apart for the zipper and cool clasps and closures. I then used them to make a colorful floral tote. So look at everything with another purpose in mind. It’s a real money saving idea and I’ll bet you’ll be pleased with some of your clever creations! 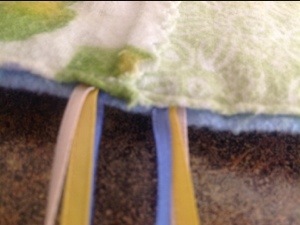 Round the bottom edge of the jumper back at the hem-line and finish raw edge with double fold bias tape. 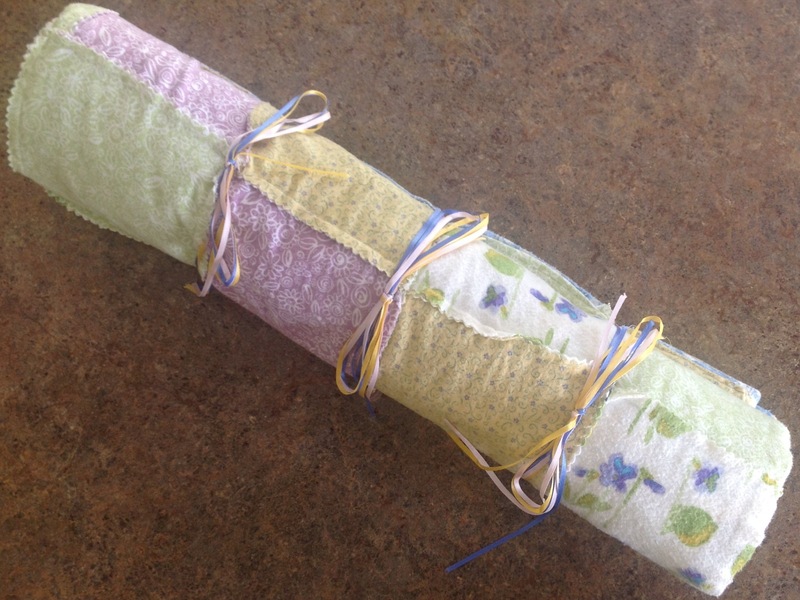 Cut two strips of coordinating fabric 4″x36″. 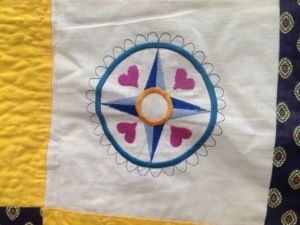 You will sew these placing right sides together, sewing 3 sides; leaving one short edge open for turning. 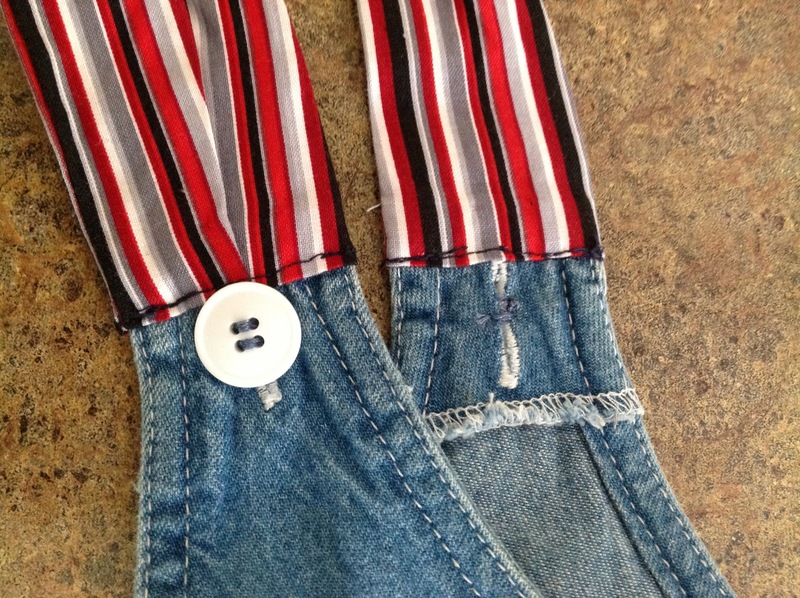 Turn strips right side out, turn under raw edge 5/8″ and attach to jumper side seam at waist line. 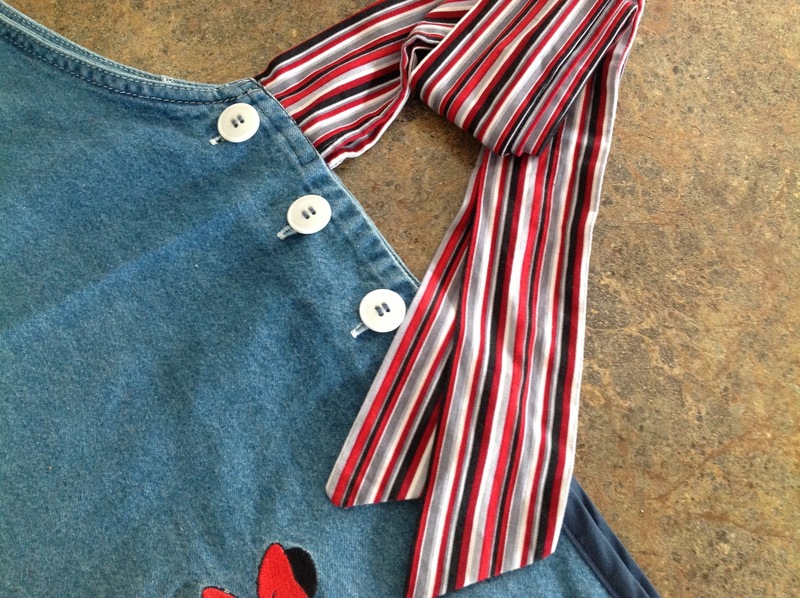 These strips will serve as apron ties. Cut two more strips 3″x14″ to make ties for the neck straps. 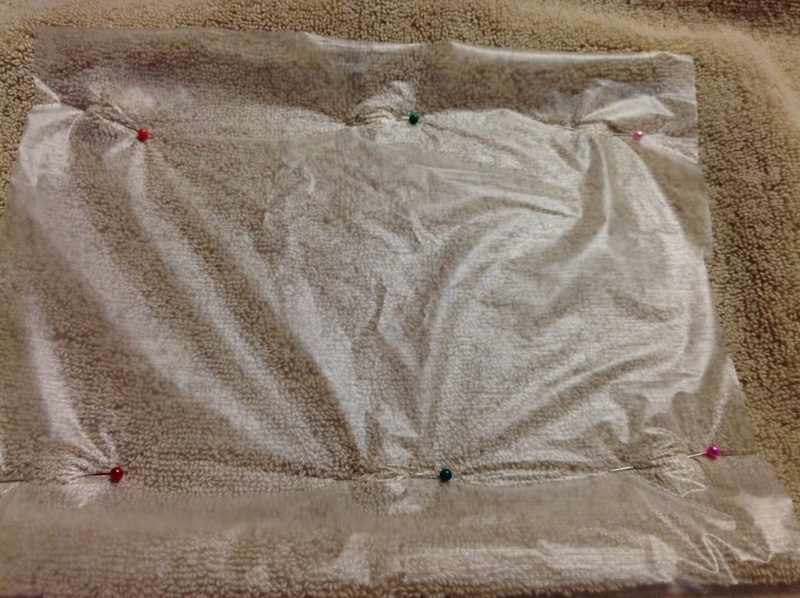 You will sew these placing right sides together, sewing 3 sides; leaving one short edge open for turning. 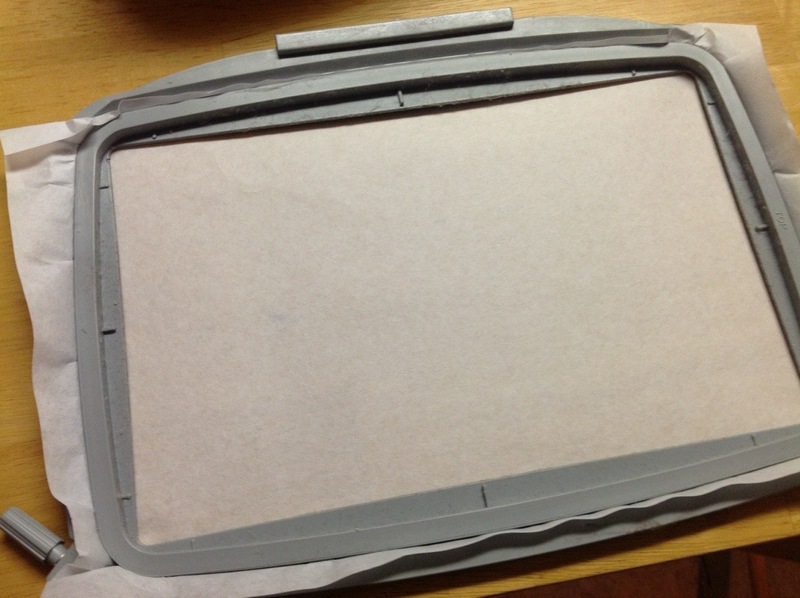 Turn strips right side out, turn under raw edge 5/8″ and attach to jumper at the shoulder strap. You may have to pleat the fabric to fit the shoulder strap width. 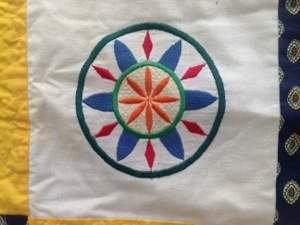 Top stitch in place. 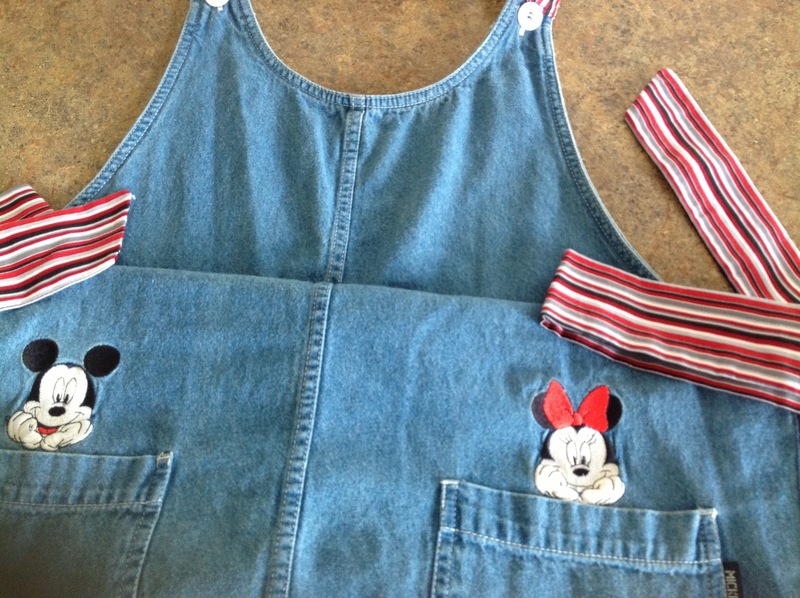 Use decorative buttons, trims, etc. 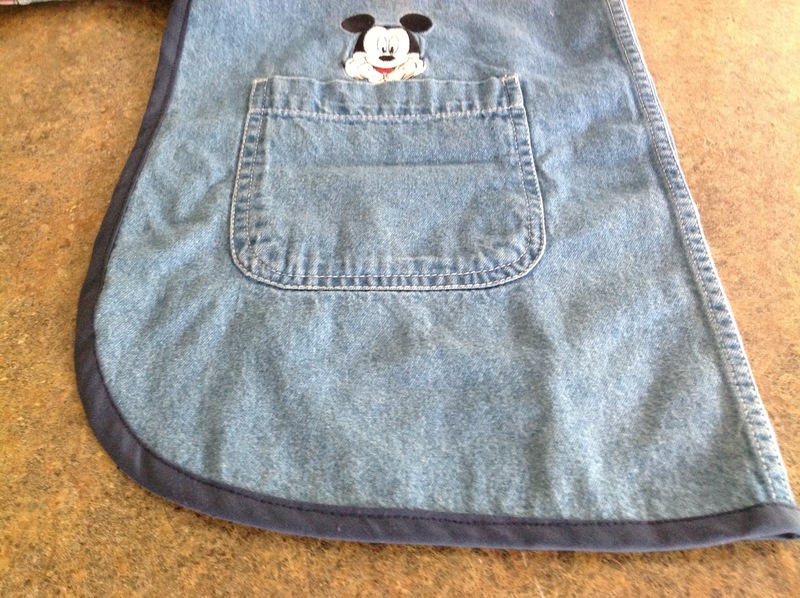 to further embellish your new apron.